The Easter Egg Hunt and photos with the Easter Bunny last Saturday in Jacinto City were typical of Easter celebrations for all ages, taking place from last Saturday through Easter Sunday. 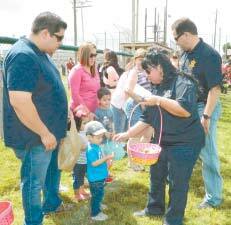 At left, Mayor Ana Diaz and Constable Chris Diaz hand out candy and gifts to some of the children waiting in line for the egg hunt. At right, kids scramble to pick up the 5000 eggs provided by the city. Four of them had special prizes inside. Religious services and Sunrise Services were also planned for this weekend.